Auditor Generals long awaited report on Pacific Carbon Trust finally released and surprise surprise….there are big problems all around. – Laila Yuile on politics & life in B.C. Auditor Generals long awaited report on Pacific Carbon Trust finally released and surprise surprise….there are big problems all around. “I agree, few people in this province will deny the need for industry and commercial business to cut harmful emissions. But after a closer examination of the people and the projects initiated by our premier, it’s clear things are not what they appear to be. There are no strict guidelines and far too many loose ends to ensure that this tax money it being well spent, and in the end, how much has any of it impacted how the majority of industry in BC does business? It might make good copy, and even better PR for the companies touting their ‘carbon neutrality’, but I’m guessing the only thing Gordon Campbell’s Green Dream has done, is lined the pockets of more than a few industrious businessmen in BC – and no one has been the wiser. Sure, buying some carbon offsets might contribute to some great new clean energy or some amazing new industrial mechanism that isn’t firing out some black toxic smoke, but remember this. Those same carbon offsets are doing nothing to stop the current and ongoing, real-life every day emissions that are happening right now as we speak. On that one point alone, I question all of it. This program is doing nothing to stop, or even really change the way big, powerful polluters are doing business at this very second. But hey, at least some CEO can say: ” We manage to minimize our tremendous environmental damage by purchasing carbon offsets….” Maybe, just maybe he or she really believes it’s doing some good, but I doubt it. More likely they view offsets as a free pass to commit environmental treachery, sanctioned by the government. An Audit of Carbon Neutral Government, the majority of offsets purchased to meet government’s carbon neutral goal in 2010 were not credible. The audit examined two projects which accounted for nearly 70 percent of the offsets purchased by government to achieve their claim of carbon neutrality: the Darkwoods Forest Carbon project in southeastern B.C. and the Encana Underbalanced Drilling project near Fort Nelson. Now. I don’t often tell you, I told you so… but, I did. I would even suggest a full forensic audit of this entity. And we won’t even talk about the fact that Encana’s name pops up yet again…. $647,670.00 in contributions since 2005 to the BC Liberals. Hmmmm. And I didn’t even get into the political interference involved with the creation and release of this report. Heads should roll. Many of them. And when people ask me why I want the BC Liberals to go, or what made me create that soon to be updated list of way more than 100 Reasons the BC Liberals should go…. I send them links like this one. We sort of had a premonition of what was going to happen this week so we visited your site on Sunday and found Tansey’s involvement in promoting PTC. Your 2010 Post certainly gave us the incentive to keep looking……. and looking forward for more today. As do I North Van, I have more info but honestly, on a Spring Break week, on the cusp of a long weekend that many will make a longer weekend because of the good weather forecast… I am going to hold off until next week when all the regular parental working people and good weather all-in-sickers are back at the desk. Because this is potentially the biggest scam ever played on the people of BC. And someone, or some people, should have to answer for this. 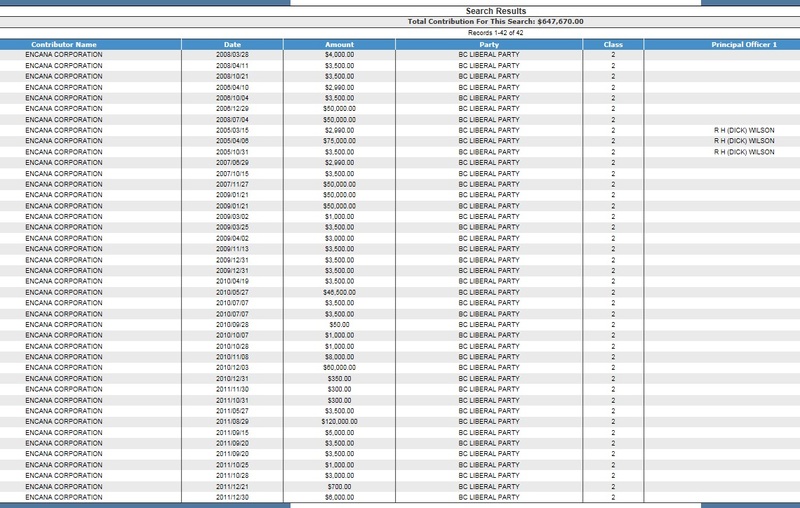 And if I worked at the BC securities Commission, I would be wondering how much stock in all these companies were sold, between the time the PCT informed its interested parties that something was up…. and the time this report was released. I believe that they call that insider trading in some circles. Thanks so much for the update. I wonder if the Encana contributions to Christy and her Liberal crooks matches the Skytrain ticket that is broadcast so many times on CKNW !! Christy still has to pay her dues for the BC Rail theft. I guess the Harry Bloy $70,000 pay back was a good number as it matches their Dix ad. Do NOT… get me started on those damn ads. How much are those radio/broadcast ads costing us anyways? Up to current date. MLA Harry Bloy has enough on his plate. The $70,000 was acknowledged by the BC Liberal Party coffers to be their responsibility for Brian Bonney’s doing 50/50 Partisan / Government Politics while working as an OIC to Christy Clark’s Office of Premier… aka OOP acronym. All that Bloy did??? Ethnic Memo Minister, was pin a medal on Bonney’s chest… Queen Elizabeth Golden Jubillee.. which should be clawed back by the Governor General of Canada! All of the parties that have a vested interest in this like politicians who need to be re-elected and people getting their money from PCT say that Mr Doyle doesn’t know what he is doing. A respected auditor who has nothing to gain one way or the other has questions. I trust John Doyle without reserve. I do not trust our current government, past and present, one bit. From what I have seen, and written from two years ago, my money is on Doyle. Thank you. And I agree. The smear campaign on his is absolutely ridiculous. This is not just accounting standards. This is what is right, and what is wrong. Pure and simple. The above, plus a shift in poles, what was true north has shifted by more than a few miles, which nobody can effectively explain, and also unusual activity coming from the sun. The earth, since time began, has experienced climate change. Periods of intense heat ,periods of cold, some precipitated by events and others not. Total Contribution For This Search: $772,170.00 for encana. I’m guessing you used the s-a1-a, which only shows party donations. Can’t seem to post the screen shot, but check your inbox for it. Thank you Brad, I believe you are correct and WOW… I am happy to have been (rarely) proven incorrect!!! Encana gave even more to the BC Liberals than over $600,000 ? Wow…. If we were in Quebec, there would be an inquiry and confessions going on right now as to what that kind of money would…. When the cap and trade system came to prominence, it occurred to me that any scheme that involves a market will be subject to corruption and will likely be corrupted. Markets are for making money, generally at someone else’s expense, and they almost never coincide with the public good. It has been clear since Gordon Campbell hollowed out the Liberal Party of BC that his group would serve the interests of a narrow spectrum of the business community and that the common good would be kept for speechifying. Again, thanks for being on top of this, both the past posts and the current material. BINGO… markets are for making money. And you are welcome. Perhaps I was a bit ahead of the times on this one, but I did inform some people and they declined to acknowledge anything was amiss until ” they did an FOI” on it. I love you more every day! Laila Yuile for the next Auditor General!! Ha! I love you too John. Am I the only woman who dreams of his position? Perhaps…. Laila, I wouldn’t be too concerned about possible smear campains and them trying to question John Doyle’s competance. I think Mr. Doyle goes to sleep tonight with a smile on his face looking forward to tommorrow. I have ALWAYS thought the “Carbon Credits” initiative was a huge scam from the getgo. Smoke and mirrors. Lets see. A huge multinational corperation that pollutes can buy ” tracts of virgin forest in say , the Amazon” to “offset their pollution”. wow! No room for scams there. Make the local polluters clean up their act. And if foreign companies try and sell their “dirty” manufactured goods in our country they will have to pay a “dirty” carbon tax. If you want to sell here, keep it clean. Trouble is ,Canada is one of the WORST polluters. Run by dishonest politician – can you say a new banana republic ? My comment was aimed at Campbell et al – our disgraced former premier and his fellow trough feeders – all sadly lacking in principles. Clearly the PCT scam is nothing more than a political attempt of milking the public including hospitals,school etc., for money – with absolutely no concern shown to what damage this is causing. Of course this charade needs to be stopped, but you can be rest assured it will meet a lot of opposition from big businesses and corporations along the way. Thanks again for your links Laila, they do a lot of good explaining what is happening. I listened to the cbc this morning, Mar. 28/13, regarding carbon offsets and the totally uncredible Pacific Carbon Trust allegations against John Doyle. What, you think carbon offsets is rocket science? John Doyle is an expert auditor, and, I believe, smells yet another horrible BC Liberal scam! Coming from Gordon Campbell’s corporate cronies, you absolutely know that this is yet another gigantic scam, like the BC Rail debacle, for which the beleaguered citizens of BC will pay an enormous price, and certain corporations will reap criminal rewards. By the way, I am a free enterpriser. No, I disagree. These offsets are never credible. The whole idea of offsets is deceptive and wrong. It’s a direct public subsidy of businesses. But it’s disguised as something else. If a business is benefitting from an emission-reduction project, let them pay for it, don’t take money out of schools and hospitals. If the Govt wants to directly subsidize a business investment in an emission-reduction project, that’s possible, if people accept that. But what they are doing is trying to hoodwink people with this phony ‘carbon-neutral’ idea. Excellent points. Thank you Hugh. First time commenting here but this has brought up the bile in me. We should be reducing our footprint and not playing a game where things just get shuffled and someone pockets a bag full of money. This buying credits is CRAP! Credits do not one iota of reductions. Reduce your own waste and do not expect me to pay through my taxes. Great blog Lailla. Keep going at em’. Missed out “produce” in above quote about one iota of reductions. Thank you JR for the kind words. And in my opinion there is nothing here to be salvaged. I agree the carbon offsets industry is a total scam. Basically, it gives license to polluters to pollute via the dubious practice of offsets. A very shady area ripe for misdeeds. If the process only involved private companies that’s their business if they want to partake of the scam. But, when public entities like hospitals and schools have to cough up money to private companies it becomes our problem. I see no way to salvage this process. Just shut it down and start enforcing pollution laws we have on the books already. I agree, we all agree here it seems and so does Bob Simpson – this is an excellent letter posted on his site and sent to Mike DeJong.